When Lara was a baby we had never heard of Brush Baby DentalWipes and we started brushing her teeth when her first teeth came through - she HATED it (I blogged about her toothbrush hatred ages ago) and it wasn't until she was nearly 3 years old that she settled down to toothbrushing (introduction of an electric toothbrush helped with this). With Holly we are hoping for an easier ride and to start her dental hygiene journey we have been trying out the DentalWipes from Brush Baby that we were sent to sample. Brush Baby products use Xylitol which is a natural sugar replacement which is also known to prevent the bacteria in your mouth from producing acids; the wipes are also fluoride-free so you don't need to worry about rinsing your baby's mouth out after use. The dental wipes are designed to be your baby's first step into the world of oral care, for use to clean the gums and those very first peeking points of teeth before you are able to brush them. The wipes are tiny little disposable sheaths which slip over your finger and you rub it over your baby's tiny gums. They come in a box of 12 and each wipe comes in a sealed sachet. When you open the sachet you place the wipe over your index finger and remove the covering to reveal a soft, lightly textured moist area which includes the cleaning ingredients. We found the wipe to be easy to use and Holly seemed quite happy to let us use them in her mouth. I tried one myself to see what it felt and tasted like - more or less tasteless but ever so slightly sweet from the Xylitol. The wipe has a small area around the outside of your finger where the back and the front join. I call it the hem. It is about 3mm wide and it feels a bit flappy and because your finger isn't in control of these bits at the edge, the hem goes to places in your baby's mouth that you hadn't thought of. When I tried it on me, it felt a bit uncomfortable but the cleaning area itself was soft and nice to feel on my own gums. 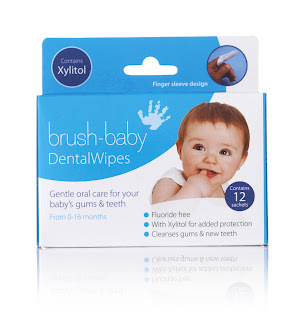 I think that the Brush Baby DentalWipes will come into their own when Holly starts weaning (which won't be that long... eek!). I think they will be handy to have around after meals and snacks to make sure her little mouth stays clean and to get her into the habit of having her teeth cleaned. Given how hard I found it to clean Lara's teeth when she was tiny, I'm grateful for these little dental wipes. I'm not sure there will be a lot of use in them as I would hope to move onto a brush as soon as teeth start coming through - we have a chewable toothbrush from Brush Baby ready and waiting for Holly after a successful trial on Lara earlier this year.